It’s hard to know which is worse: the arrogance of the Obama administration in assuming that its White House staffers can get away with anything, or the apathy of the media in not holding those staffers accountable. Actually, let’s scratch the word “apathy” and call it what it really is: abjectness. The media have been abject in their willingness, even eagerness, to serve the political interests of this administration and its re-election effort. Let’s consider the cases of three staffers, all at the top rung of the White House ladder: Senior Adviser Valerie Jarrett, Senior Adviser David Plouffe, and National Security Adviser Tom Donilon. Valerie Jarrett has been a mentor and ally of Barack Obama for two decades; by all accounts, she has an unshakable bond not only with him, but also with Michelle Obama. And now her clout is apparent to all: aprofile of Jarrett, written by Jo Becker and appearing in Sunday’s New York Times, was headlined, “The Other Power in the West Wing.” As in, there’s the President, and there’s Valerie Jarrett. Indeed, Becker’s story was full of grist for Beltway mills. One anonymous presidential adviser (who sounds a lot like re-election campaign guru David Axelrod) pronounced that “Valerie is effectively the chief of staff… She’s almost like Nancy Reagan was with President Reagan, but more powerful.” And a “former senior White House official” (who sounds a lot like ex-White House chief of staff Bill Daley) added, “She is the single most influential person in the Obama White House.” Whoa. Wait a second. Did the former official really mean to say that Jarrett was “the single most influential person in the Obama White House”? If so, where does that leave the President? Is it possible that Jarrett, working with Michelle Obama, is more powerful than Mr. Obama? No, that doesn’t seem possible–unless, of course, it is possible. If the former senior official quoted above is Bill Daley, he should know about Jarrett’s vast power. As the Times article recalls, he was basically pushed out of the White House by Jarrett after a battle over the Obamacare contraception mandate. 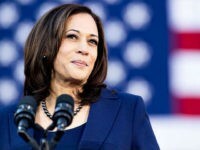 That mandate infuriated Catholic and conservative groups, but it has been championed by Jarrett inside the White House and by feminist groups across the country–and Jarrett and the feminists have prevailed. So, in assessing Jarrett’s power, we can include in her coalition the nation’s feminists as well as Mrs. Obama. And inside today’s Democratic Party, that’s big power. No wonder the man who currently holds the title of chief of staff is so obscure–he has learned that you last longer if you keep a low profile. A case in point is her full-time Secret Service detail. The White House refuses to disclose the number of agents or their cost, citing security concerns. But the appearance so worried some aides that two were dispatched to urge her to give the detail up. She listened politely, one said, but the agents stayed. So let’s get this straight: Jarrett gets a security detail from the US Secret Service (USSS). That means 24/7 protection, at a cost of millions of dollars a year. 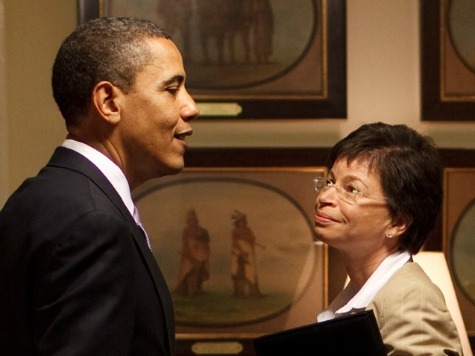 Of course, it also means an air of importance for Jarrett–her own taxpayer-funded entourage. The idea that someone such as Jarrett–who officially plays no role in national security or counter-terrorism–would receive USSS protection would be laughable if it weren’t, in fact, real. It’s like a tale out of the Versailles Court of the Sun King–the sort of anecdote that provokes the peasants, eventually, to revolution. But in the meantime, before the deluge, Jarrett plans to live it up; surrounded by agents with guns, she is queen of her own court. In other words, for pure conspicuous consumption, Jarrett puts her fellow Chicagoan, the laughably self-important Desirée Rogers, to shame. As an aside, on the issue of who merits government security, we might recall the case of Molly Norris. In 2010, the Seattle-based cartoonist took part in the international “Draw Muhammad” campaign and, after she receiving death threats, the FBI told her that she was on her own. That is, the US government could not–more precisely, would not–protect her. Instead, Norris was advised to leave her job, change her name, and go into hiding. And that’s what she did; what choice did she have? At the time, some of us wondered how Uncle Sam could let the jihadists win a victory such as this inside the United States. Now we know that government security resources were, in fact, spread thin–because Jarrett was being well taken care of. Bottom line: Norris faced real threats and received no protection, while Jarrett faces no threats–at least no threat that 100 other West Wing aides haven’t also received, and none of them have details–and yet she receives all the insulation from the world that her ego demands. In the wake of the USSS revelation, the press could be asking all sorts of questions: Who made this decision? How much is this costing? Does Jarrett drive her own car–or do those same Secret Service agents chauffeur her around? Most likely, the MSM will not ask any of these questions. Yes, as was said of Becker’s Times piece, the political world will stop to read it, but most readers will be reading it with an eye towards power calculations in DC, as opposed to cost calculations for the taxpayers, or any concern about the modesty of public officials. What if, during the gathering-storm decade of the 1930s, a senior White House aide in the Franklin D. Roosevelt administration had been found to have taken big money from a company dealing closely with the Nazis? Would it would have been a huge scandal? Of course it would. Taking money from business partners of the Iranian regime would seem to be a big deal, indeed, and the Post’s Tom Hamburger and Peter Wallsten deserve credit for breaking the story. However, the Post as a whole, as well as the rest of the media, deserves only discredit for letting the story drop there. If Plouffe had worked for, say, the Bush 43 administration, the furor never would have never stopped–including calls to return the money, calls for resignation, calls for a special prosecutor. But since it was the Obama administration, nothing of the kind has happened. The press has been, well, abject. Most flagrantly, just on Sunday, Plouffe was on ABC’s “This Week with George Stephanopoulos,” and in the course of a ten-minute interview, Stephanopoulos didn’t once bring up the matter of the $100,000. 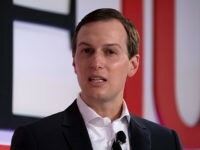 Nor did Stephanopoulos confront Plouffe with a question about the huge Iranian triumph of the previous week, as leaders from 120 nations, gathered in Tehran, unanimously endorsed the Iranian nuclear program. In other words, those 120 countries had completely refuted Obama administration efforts to de-nuclearize Iran through diplomacy. The American Jewish Committee called the endorsement a “dark day for humankind,” but the ABC man had no questions on the topic. Of course Stephanopoulos was easy on Plouffe. After all, Stephanopoulos spent the first 15 years of his career as a liberal Democratic political operative, and then, having made an easy and lucrative transition into the media, he has spent the last 15 years denying that there’s any liberal Democratic bias in the media–and he was at it again just on Sunday. Stephanopoulos asked plenty of questions, even some hard ones on the campaign horserace, but he also tossed in plenty of softballs, such as a question about the Clint Eastwood skit in Tampa. But nothing that would fluster Plouffe. Indeed, the headline atop Stephanopoulos’ story on the ABC News blog delivered the bacon for the Democrats: “David Plouffe: Romney Campaign Built on ‘Tripod of Lies. '” No mention of any defect in Obama, let alone Plouffe–just straight Obama talking points. We all remember the Sherlock Holmes story about the dog that didn’t bark; well, this was Stephanopoulos not only not barking, but also himself being a lapdog for the Obamans. Finally, there’s Tom Donilon, the President’s National Security Adviser. As I first declared in June, Donilon is surely responsible for many of the leaks coming out of the White House, all of which seemed to advance the cause of making Obama look like a tough Commander-in-Chief. These were leaks that Sen. Dianne Feinstein, Democrat of California and chair of the Intelligence Committee described as “very, very disturbing.” She added, “It’s dismayed our allies. It puts American lives in jeopardy. It puts our nation’s security in jeopardy. And what has been the White House response? How have the Obamans reacted to accusations that they have put our national security in jeopardy for partisan gain? Attorney General Eric Holder did the following: he appointed two underlings as in-house investigators. This non-dynamic duo can can be relied upon to a) wait on releasing their findings after the November election, and then b) not find anything anyway. Meanwhile, stupefyingly, the White House has deployed none other than David Axelrod to be part of the rapid-response team; even though he is not part of the national security council, or even part of the government, he has been making the rounds on TV, doling out the White House spin. Understandably, Donilon himself has kept a low profile since the leaks and their blowback. Yes, he is a longtime Democratic political operative with no real national security credentials. Yes, former Defense Secretary Bob Gates warned that Donilon would be a “disaster” if were ever to become national security adviser. But Donilon had reason to think that he would be okay if he just hunkered down. Yet now, from out of his own sordid past, new revelations arise to haunt him. Thanks to Andrew Stiles at The Washington Free Beacon, we now know that Donilon has been receiving a $148,000-a-year pension from Fannie Mae. Indeed, it’s hard to know where to begin on this one. After working in all those Democratic campaigns, Donilon found his inside-the-beltway reward–a cushy lobbying job at Fannie Mae, the place where all hacks went to get rich, even as Fannie made the country poor. The Fannie bailout has, in fact, cost taxpayers more than $154 billion through 2010, and the company is still, today, losing billions every quarter. Those who might wish more detail on Fannie Mae might consult Gretchen Morgenson’s 2011 book, Reckless Endangerment: How Outsized Ambition, Greed, and Corruption Led to Economic Armageddon; in those pages one will find all the information needed to know about Donilon and all the other wolves of Washington. And yet the MSM aren’t interested–and thus the Beacon’s Donilon revelation sank without a trace, leaving the leaker-in-chief still on the job. Indeed, were any reporters to take these stories seriously, they would also find that they had struck a resonant chord with the American people. According to pollster Scott Rasmussen, 64 percent of Americans say that “government ethics and corruption” are “very important”; that’s a number second only to the economy and healthcare, and ahead of taxes, education, and Social Security. And Gallup polling finds reaches the same conclusion. In other words, serious journalistic digging would likely yield up not only scoops, but also clicks. But instead, nothing. The dominant media see nothing, hear nothing, and say nothing. And the same holds true, we might note for the so-called “reform” outfits. Why aren’t Common Cause, the Center for Public Integrity, CREW, and Pro Publica all over these stories, applying their own considerable resources to the unearthing of the truth? It’s too easy to say that this deliberate overlooking of scandals is purely partisan. In fact, sometimes Democrats have gotten rough treatment. During the Carter administration, the 39th president was tormented by reporters chasing down everyone and everything, from Bert Lance to the mythical “killer rabbit.” And during the Clinton years, the 42nd president was investigated for, well, just about everything; yes, the media liked Clinton, but the media also liked attacking him. But Obama is different. Reverence, plus political correctness–plus, perhaps, fear of giving Tea Party-ized Republicans any sort of victory–means that a protective pall has encased the Obama Administration. That protectiveness means, as we have seen, not only the non-curiosity about Jarrett, Plouffe, and Donilon, but also non-curiosity about other stories. For example, in the energy sector alone, the MSM offers perfunctory coverage of the Solyndra bankruptcy, and then moves on. And reports about dubious dealings at Exelon are a one-day wonder. And when Peter Schweizer asserts that as much as 80 percent of the government “investments” for “green energy” went to Obama donors and bundlers, well, that story is ignored–no reporter wishes to connect the dots. Such a supine media are Obama’s biggest advantage in this election, and they could spell the difference for him this November. So how to sum up these scandals that don’t scandalize? We could call label them all as the Audacity of Corruption, but the word “audacity” implies a certain measure of risk-taking. And as we have seen, Jarrett, Plouffe, and Donilon seem to be taking no risk at all.